Puzzling Question, A: How Can The Old Be Made New? 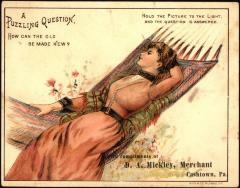 Color printed "hold to light" type advertising card promoting Diamond Dyes, manufactured by Wells, Richardson & Co. Depicts a young woman lying in a hammock. Captioned "A Puzzling Question, / How Can The Old / Be Made New?" in upper left of front. When held to light, a figure of cupid holding a sign labeled "Diamond Dyes" appears above the woman, and the phrase "It's Easy to Dye / With Diamond Dyes / Any Thing / Any Color" appears to the right of woman. Labeled "With compliments of / D.A. Mickley, Merchant / Cashtown, Pa." on lower right of front. Labeled "Gies & Co. Buffalo, N.Y." in lower right corner.